China’s Tiangong-2 space laboratory launches atop a Long March 2F rocket from the Jiuquan Satellite Launch Center on Sept. 15, 2016. Now is a good time to view China's newly launched space lab. Tiangong-2 launched Sept. 15 from China's Jiuquan Satellite Launch Center aboard a Long March 2F rocket. The orbiting laboratory, which is expected to be occupied by two astronauts later this month, should be readily visible to early risers over the next couple of weeks. The International Space Station orbits Earth in a 51.6-degree inclined orbit that ranges from 233 miles to 248 miles (376 to 399 kilometers) high and is visible from 95 percent of the inhabited land on Earth. But Tiangong-2 (whose name means "Heavenly Palace" in Mandarin) orbits Earth at a somewhat lower inclination of 42.8 degrees and at a lower altitude of 122 to 214 miles (197 to 345 km). As such, it is visible from about 80 percent of inhabited land areas. For places north of about latitude 60 degrees north, Tiangong-2 will never rise above the horizon to be visible. This includes much of Alaska, the northern half of Canada, Iceland, Norway, Sweden and Finland. And for places just a short distance farther to the south, Tiangong-2 will never get very high above the southern horizon, an altitude of less than 10 degrees (the apparent width of your clenched fist held at arm's length). This includes the cities of Juneau, Alaska; Edmonton, Canada; Dublin, Ireland; and Copenhagen, Denmark. 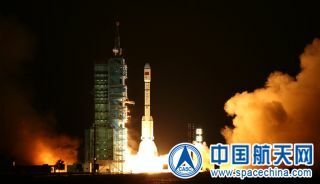 The appearance of this newly launched Chinese spacecraft moving across the sky is not in itself unusual. Truth be told, on any clear evening within a couple hours of local sunset and with no optical aid, you can usually spot a number of artificial satellites creeping across the sky like moving stars. Satellites become visible only when they are in sunlight and the observer is in deep twilight or darkness. This usually means shortly after dusk or before dawn. What makes these upcoming passes so interesting is that you'll be able to see China's newest space laboratory module, which is expected to set the stage for the future of that country's ambitious space program — an important part of China's stepping-stone strategy to human spaceflight. Between Oct. 9 and Oct. 24, Tiangong-2 will be visible across the United States, southern Canada and much of Europe as a morning object, sailing across the sky before sunrise. And from about Oct. 31 through Nov. 16, Tiangong-2 will be visible after sunset in the evening sky. And this is a sight that should be easily visible to anyone, even those located in brightly lit cities. More often than not, Tiangong-2 should shine with a brightness of about magnitude +2, making it easily visible with the naked eye. Magnitude 2 is as bright as Polaris, the North Star, on astronomers' brightness rating scale. The brightest stars are of magnitude 0 and +1; the faintest stars are in the range of magnitude +5 or +6 (the lower the number, the brighter the object). On its most favorable/highest passes, Tiangong-2 could shine as brightly as magnitude +1. For passes where it appears very low above the horizon, the Chinese space laboratory will appear dimmer, perhaps with a magnitude of only +3 or +4. Each will ask either for your ZIP code or city, and respond with a list of suggested spotting times. Predictions computed a few days ahead of time are usually accurate to within a few minutes. However, these forecasts can change due to the slow decay of the object's orbit, so check frequently for updates. Another great site is http://www.n2yo.com/?s=41765, which provides real-time satellite tracking. It shows you the locations over the Earth where any of a number of satellites may be, at any given moment during the day or night. Tiangong-2 is the second operational component of China's Tiangong program, which aims to place a larger, modular station into orbit by the year 2023. Later this month, Tiangong-2 is expected to have company. Shenzhou-11, a planned crewed mission of China's Shenzhou program, is scheduled to launch on Oct. 17. Shenzhou-11 will dock with the Tiangong-2 space laboratory; its crew of two will then stay aboard the lab for 30 days. A Tianzhou-1 cargo vehicle is also expected to dock with the new space lab to deliver supplies. Tiangong-2 replaces the prototype module Tiangong-1, which launched in September 2011 and lost contact with ground stations last March. In September, after conceding they had lost control over the station, officials announced that Tiangong-1 would probably burn up in Earth's atmosphere late in 2017.